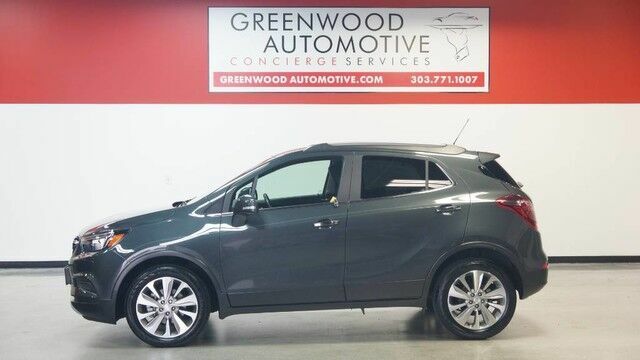 Greenwood Automotive has a wide selection of exceptional pre-owned vehicles to choose from, including this 2017 Buick Encore. The Buick Encore competes with other small SUVs and crossovers as well as with some of the more premium small cars available on the market. It offers buyers an appealing blend of small size, luxury and SUV-like practicality. All-wheel drive is available, but the Buick is less about off-roading and more about all-weather driving in comfort. Luxury-oriented touches abound that usually are reserved for cars costing much more. The Encore is a great value. This model sets itself apart with lots of standard features, available all-wheel drive, great fuel economy, Quiet, refined, and spacious ENCORE PREFERRED EDITION, LOW 14K MILES, ALLOY WHEELS, BACKUP CAMERA, FULL BLUETOOTH, SOLID MAINTENANCE HISTORY, FWD, TRACTION CONTROL, LOOKS AND RUNS GREAT, STILL CARRIES THE BALANCE OF BUICK'S FACTORY WARRANTY! COME CHECK IT OUT! WWW.GREENWOODAUTOMOTIVE.COM for all Photos Our Dealer Handling fee of $499 is included in our advertised price. Government fee's and licensing are additional costs. For best service and to check availability or to set an appointment to see and drive call Steve direct at 720-339-1516 or Marc 303-552-7909 For more information. FINANCING AVAILABLE. TRADES WELCOME. *VEHICLE IS FULLY INSPECTED BY OUR MECHANIC. We are located 4 Blocks West of I-25 on North side Of Arapahoe, Behind US Bank at Syracuse St.